In this issue: a zombie plague, a shape-shifting hedgehog, and a plethora of top-notch short fiction. Content to leave dangerous adventures behind them, Captain Daniel Leary and his friend, the spy and cybrarian Adele Mundy, settle into a peacetime existence. But a war is brewing between the Republic of Cinnabar and the Alliance of Free Stars, and Daniel and Adele are once again called to serve. But even with Daniel, Adele, and the crew of the Princess Cecile doing everything humanly possible, their efforts that may be no match for an enemy battleship. All they can do is race forward, hoping to come through into DEATH'S BRIGHT DAY. Get Death’s Bright Day here. When zombies overrun the Earth, brave men and women ask themselves: “What do we do now?” For a group of neighbors in the Chicago suburbs, the answer is “work together or die.” For the Biological Emergency Response Teams in New York City, it is “fight off the infected for as long as we can, before it’s too late.” And for a group of cheerleaders, it is about the end of their world—and about what happens when you get a group of physically fit young women really, really angry. Featuring original stories from the brightest stars in the science fiction universe: John Ringo; Eric Flint; John Scalzi; Dave Klecha; Sarah A. Hoyt; Jody Lynn Nye; Michael Z. Williamson; and more. Get Black Tide Rising here. Here are stories to challenge, provoke, thrill, and entertain, from giants of the genre and the hottest new voices. Culled from the ranks of the top print and digital science fiction outlets, The Year’s Best Military & Adventure SF 2015 is sure to delight fans of Golden Age science fiction, modern military SF, thrilling pulp adventure tales, and more. 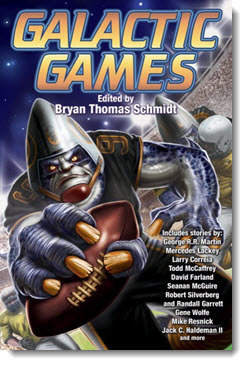 Featuring stories by David Brin, Brad R. Torgersen, Joe R. Lansdale, Sarah Pinsker, and many more. 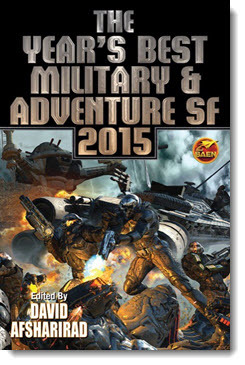 Get The Year’s Best Military & Adventure SF 2015 here. From downhill figure skating to horse racing with alien life forms; from baseball played with speedboats to basketball on Mars and golf on the Moon; from alien opponents to literally death defying stakes, Galactic Games takes the competition to a whole new level and shows us what happens when humanity takes sporting events to the stars. Includes stories by top selling authors George R.R. Martin, Mercedes Lackey, and Larry Correia, as well as legends Robert Silverberg, Randall Garrett, Gene Wolfe, Mike Resnick—and more. Black Tide Rising tells the stories of what regular, everyday folks do when they come face-to-face with the zombie apocalypse: they take action. But after a long day of fighting the Infected, sometimes it’s nice to hunker down in your fortified bunker and catch up on some reading. So, if you were caught in the zombie apocalypse, what three Baen books would you bring along? Let us know for a chance to win a copy of Black Tide Rising, signed by editors John Ringo and Gary Poole. 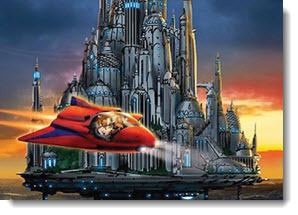 In honor of Sarah Hoyt’s new Darkship series novel Through Fire, we asked you to tell us what SF/Fairy Tale mashup would you most like to see. Congrats to Arlynn, who wins a signed copy of the novel. 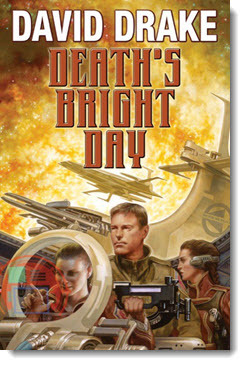 Coming soon to the Baen Free Radio Hour: David Drake discusses Death’s Bright Day, the new entry in his RCN military SF series. Jim Baen Memorial Award short story winners talk about their stories, writing processes, and their experiences with the contest in general. Plus upcoming roundtable talks with authors in the Galactic Games and Black Tide Rising anthologies! Missed past episodes? No problem. We’ve got every episode archived for your listening pleasure. When zombies overrun the Earth, brave men and women ask themselves: “What do we do now?” Featuring original stories from John Ringo, Eric Flint, John Scalzi & Dave Klecha, Sarah A. Hoyt, Jody Lynn Nye, Michael Z. Williamson, and more. Culled from the ranks of the top SF markets, The Year’s Best Military & Adventure SF 2015 is sure to delight fans of Golden Age science fiction, modern military SF, thrilling pulp adventure tales, and more. Stories by David Drake, Brad R. Torgersen, Joe Lansdale, David Brin, Hank Davis, and more. Don't forget to check out the newest ebook releases here. Plus read “Cadet Cruise” by David Drake, a new story set in the RCN series here. And check out David Brin’s Ring of Fire story “71” here. And this month’s new non-fiction essay, “Do Dungeon Masters Roll Magic Dice? Willful Self-Deception on the Campaign Trail” by former game designer Bob Kruger here. For upcoming appearances by Baen authors and editors, check here.